I became a JustFab Brand Ambassador a little over a year ago. I know, I know people hear brand ambassador and sometimes have never worn the brand clothes. The cool thing is that I shop at JustFab regularly (sometimes weekly) and being an ambassador is an added bonus. 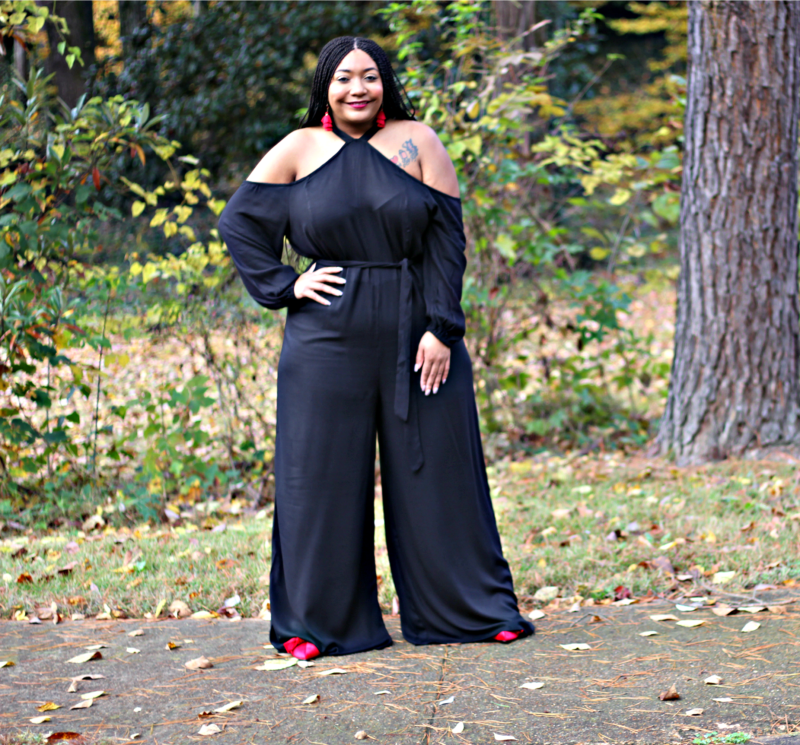 I was sent this great jumpsuit to review. Keep reading! 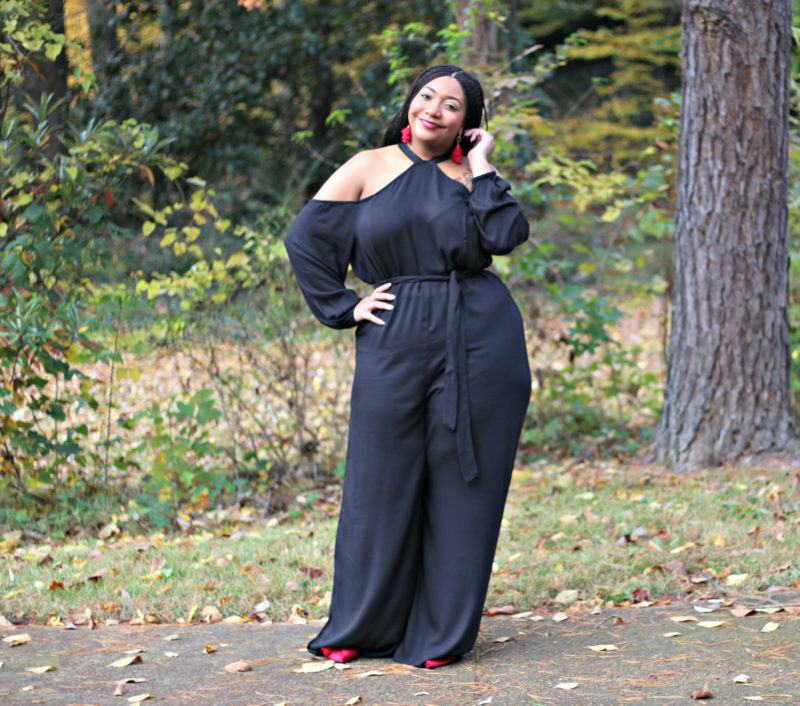 This jumpsuit is amazing! 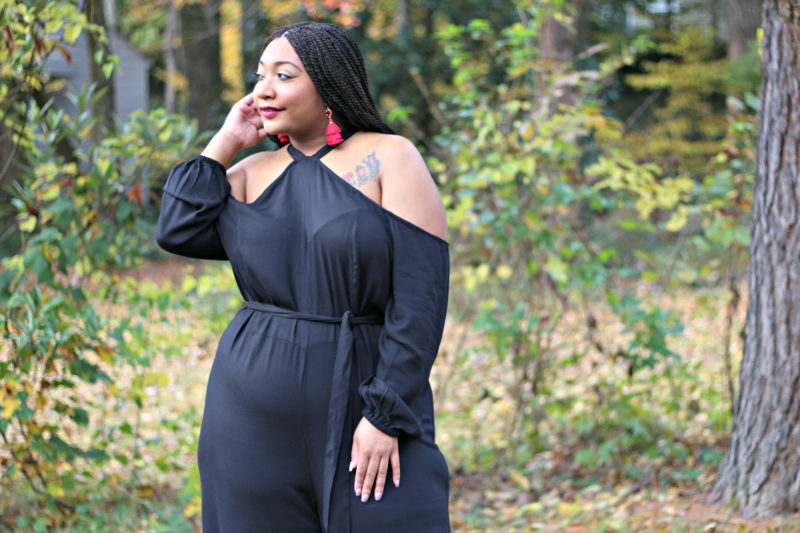 I love the shoulder detail and the long sleeves are an added bonus that makes this jumpsuit Fall appropriate. 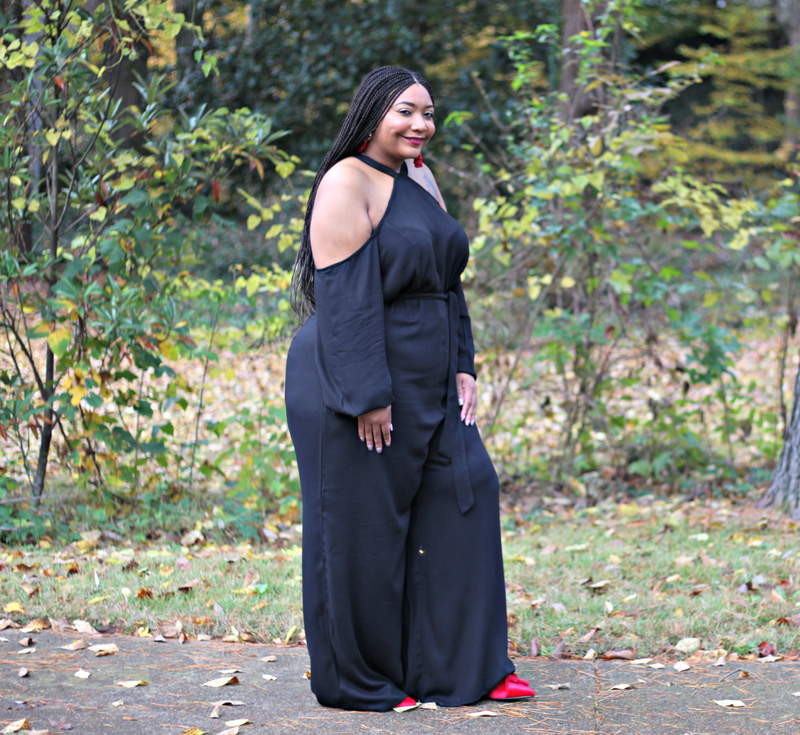 This jumpsuit is tall girl approved, I am only 5’6”, and the pants legs are long even with heels. 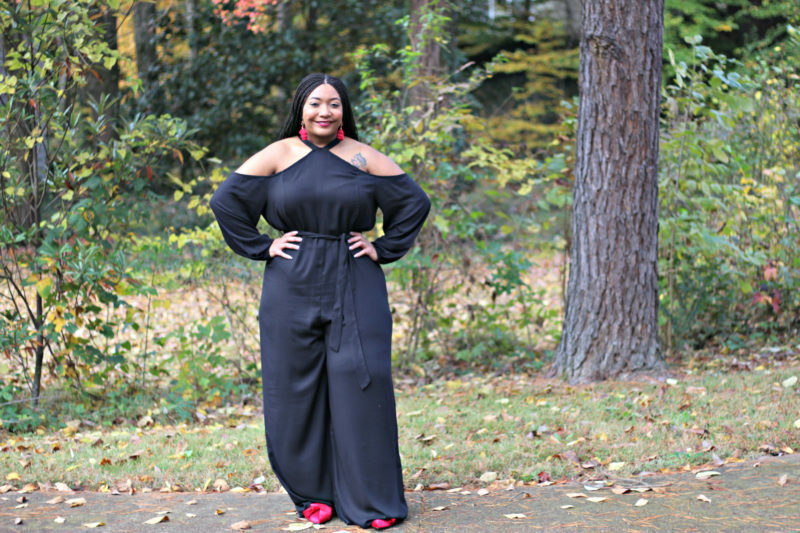 I wanted this jumpsuit to take center stage and kept the styling simple. Red is always a great choice when wearing black. Red gives a bold pop of color that is hard to miss. Adding these red velvet booties, because honestly I am obsessed with velvet, were a good choice. Wearing a bold red lip was a beautiful touch. My fringe earrings topped this outfit off perfectly. 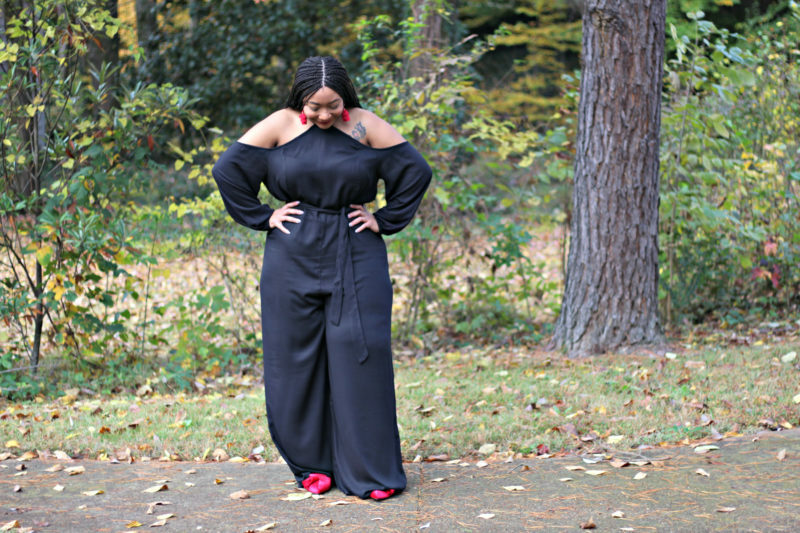 Style Notes: My jumpsuit is a 2x, I should have requested the 1x, but I was afraid of it not having stretch. My booties are true to size in a 10, and are not wide foot friendly because they are a bit narrow. I am 5’6″ and I plan to get it altered. It’s super long. Very cute jumpsuit! You look JustFab! See what I did there? Beautiful! I wish I was in the USA to try JustFab! I love them and there’s always a good deal. The jumpsuit is really cute. 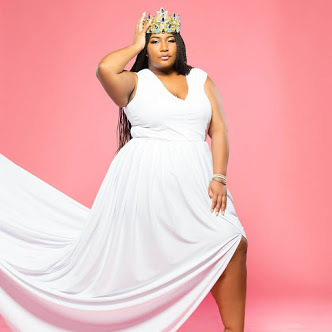 I love JustFab, and I’m so glad that they carry plus size clothes now. Yes, I love them a lot! Thank you so much Chasi!!! I love this look! I love the style of this jumper. Very nice.